American artist Alex Gross was born in 1968 and graduated from the Art Center College of Design in Pasadena before establishing himself in Los Angeles. A key figure in the pop surrealism movement, he paints with an almost photographic realism that strategically clashes with the kitschy content of his works. His paintings focus on people and current events, exploring globalization and consumerism. Both his style and subject matter are particularly influenced by his travels in Japan, where he was exposed to Japanese fine and commercial art. Gross has described this generation as “spiritually profound” yet “culturally vapid” due to the “terrible tragedy and homogeneity” of today’s technology-obsessed society. This piece, titled Selfie, is a particular reflection of that biting sentiment. 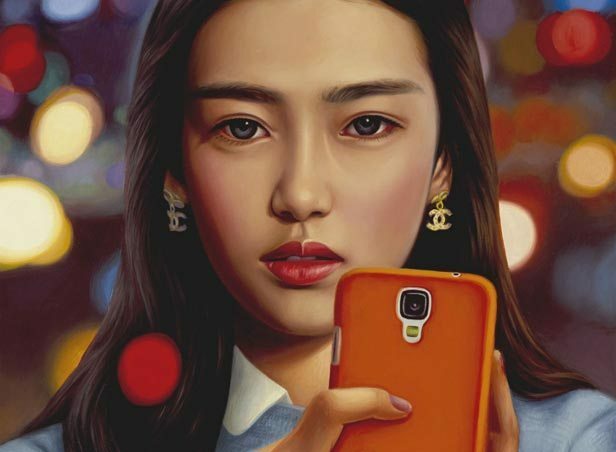 Created with oil paint on canvas, the painting features a beautiful girl, her phone stretched out towards the audience as she snaps a picture of herself. The girl is alluring, with supple, symmetrical features, yet her look is both disturbingly glazed and hollow. The lack of direction in her gaze is unsettling: it is unclear whether she is meeting the eyes of her viewers, looking at her reflection on the screen, or simply staring out at nothing. The city lights around her only highlight this eerie lack of consciousness, their cheeriness contrasting sharply with her expressionless face and her apparent apathy to her vibrant surroundings. 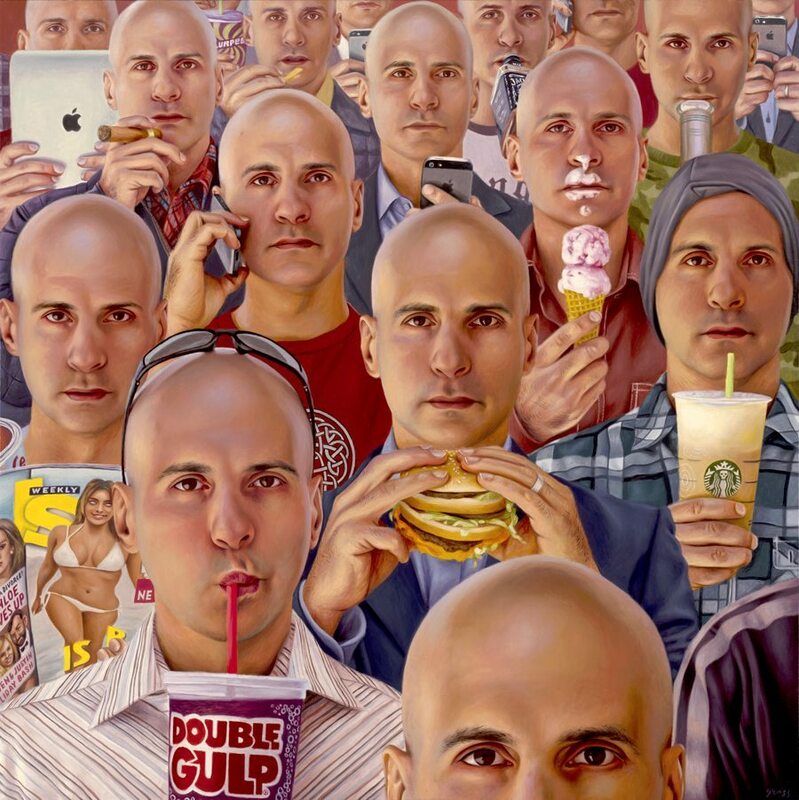 Selfie reveals the self-absorption and superficiality of today’s society. The girl’s trendy clothing and Chanel earrings are a testament to our infatuation with brand names and the images that many strive to imitate. We pander for the validation of others, obsessing over the comments and number of likes on their online posts as if the selfie was a god, and social media a religion. We are so preoccupied with creating the online façades of our lives that we, like the girl, are neglecting our real life interactions. The society that we have built is a lonely one where we are surrounded by urbanization and live in increasingly close proximity with our neighbors, yet are becoming more and more isolated by our addiction to the very technology that is supposed to connect us. Everything has become a product, and everyone has become a consumer. This world of dazzling lights and dizzying attractions was created to satiate our ever-shortening attention span, yet like the girl, we are apathetic and bored. We live in the closely cropped world of our smart-phones, shutting the rest out as the boundaries of this canvas does to the painting. The girl’s expensive earrings, her flawless makeup, even the selfie that we have interrupted: who are they for? Does she construct this image of herself for her own happiness, or for the online world in which she lives? Her perfect face looms out of the canvas, dominating the space. She is beautiful, yet generic-looking enough that she could be any one of us. Her blank gaze makes us wonder if we echo that emptiness as well. What statement do you think this painting is making? Do you feel entranced by the girl’s perfection, or disturbed by her vacant stare? The emotionless seriousness of her face is quite haunting. 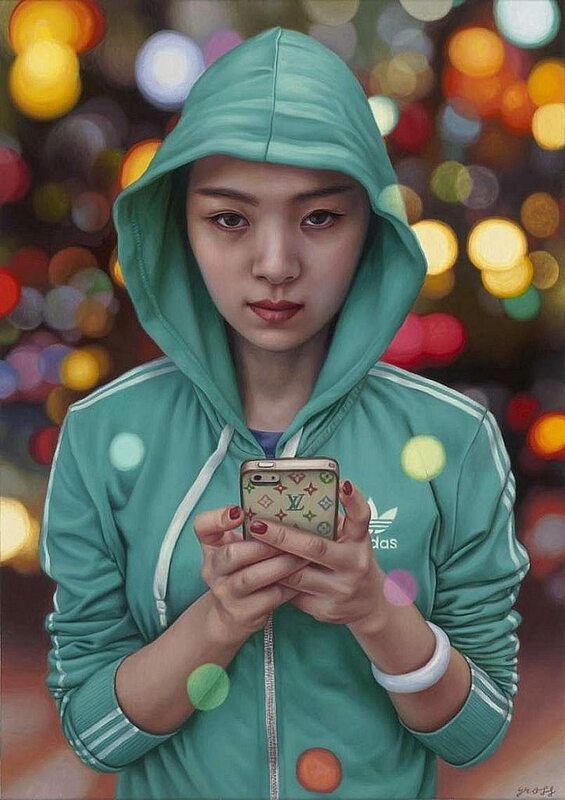 The reflection of the girl’s clothing and phone case on today’s society is very accurate, but her blank stare suggest that these materialistic things is not enough to make one happy. Alex Gross’ realistic oil paintings offer a raw and brutally honest reflection not only of himself, but society as a whole. We have been consumed by our reliance on technology not only for business, but even social interactions as well. The unbreakable tether connecting us to our phones and computers has effectively disconnected us from one another. Technology has allowed us to connect with people around the world, yet we seem to be less connected with others than ever before. Gross’ “Selfie” highlights the homogenous existence created by anonymous and impersonal relationships on the internet and his use of canvas and oil painting harkens back to a simpler age of creativity and connection.